Ganesh Chauth, also known as Ganesh Chaturthi or Vinayaka Chavithi, is the festival of Lord of Ganas and obstacles. Ganesh is a short form of Gana + isha which means he is the Lord of all Ganas or attendants or different groups of living beings. Gana word includes, in a larger sense, four types of Ganas namely Devagana, Manushyagana, Rakshasagana, and Bhutagana. Ganesha is referred to as Vighnesha also which means Lord of all Vighna or obstacles. Another term used for Vighnesha is Vinayaka which is short name of Vighna + Nayaka. Nayaka means head. So Vinayaka means Head or Lord of all vighnas or obstacles. So whoever worships Ganesh is bestowed with the power to overcome obstacles and gain success in all his activities of life. So, whoever starts a new business or activity is advised to worship Lord Ganesha at first. Ganesh Chauth is celebrated by Hindus as the birthday of Lord Ganesha on the Chauth or the fourth day of the Hindu month of Bhadrapada masa in Shukla paksha which generally falls in between the period of the second fortnight of August to first fortnight of September each year. It is celebrated for 10 days continuously from the fourth day or Chauth to the fourteenth day known as Anant Chaturdashi and the celebrations are widely known as "Ganesh Navaratri". This festival is most popular in the states of Maharashtra, Gujarat, Andhra Pradesh, and Tamil Nadu even though celebrated all over the country. The story goes that Lord Shiva, according to Shiv Purana, was returning to Kailash after getting released from the body of Gajasura, an elephant-headed demon with the help of Lord Vishnu. Parvati gets joyous and goes to take the bath to get herself ready to welcome him. When going to bath, she made the figure of a child with the sandalwood paste that she used to apply to her skin while bathing and breathed life into it and kept the child as a guard at the doors while bathing. When Lord Shiva enters, the boy stops him as he did not know him. Shiva gets enraged and beheads the child and enters in. Knowing this, Parvati weeps for the child. So, Shiva sends his ganas or troops to bring the head of Gajasura that he had brought with him as per request of that demon and joins the head to the body of the child and makes him alive. Parvati gets happy and celebrates the occasion. Later, Lord Shiva makes Ganesha the head of the ganas as he wins the test over his brother Kumaraswamy with the help of Narayana mantra bestowed to him by Lord Shiva because of his humbleness and respect to his parents. All the troops celebrate the occasion by offering various kinds of food and fruits to Ganesha. Eating all those offerings, Ganesha returns to his parents and bows down to them seeking blessings. But due to his heavy belly after eating so much food, he experiences much difficulty in bowing to them seeing which the Moon on the head of Lord Shiva laughs. Immediately the stomach of Ganesha breaks out and he fells down on the floor with all food scattered out from his belly. Goddess Parvati gets very angry at this with the Moon and gives a curse to him that whoever sees him will beget bad name from thereafter. Lord Shiva cools Parvati and makes Ganesha alive again. Later, all people including sages approach Parvati and request her to take back her curse upon Moon as it is not possible to live in the world without seeing the moon. Parvati realizes their problem and tells that her curse cannot be taken back but it will be applicable for one day only on this day of Ganesh Chauth each year on which day nobody should witness the moon. Later, after many years, Lord Krishna happens to see the moon in the milk on this day of Ganesh Chauth and he is also not spared from being affected by that curse. It happened that one king Satrajit once pleased Sun God through his prayers and got a golden jewel. It has some magical powers of producing gold of 160 tulas (one Tula is equal to 10 grams) daily to whoever keeps the jewel with him. After possessing it, the king happens to visit Lord Krishna and Krishna asks him to give it to him. But he does not give it and returns home. After that, one day his brother happens to wear it and go on hunting in the forests where he gets killed by a lion and then as the lion had swallowed the jewel, it gets killed by Jambavantha, an immortal vanara in the shape of a bear of the Ramayana period. Jambavantha ties the jewel to the cradle of his small daughter for playing with it. When Satrajit finds his brother missing, he accuses Lord Krishna of killing his brother and stealing the jewel. He got this false accusation because of his witnessing moon in the milk. So Krishna immediately goes in search of the man to prove himself innocent and finds the dead body of the person and the body of a lion at some distance. Then following the footprints, he reaches the cave of Jambavantha wherein the jewel was shining brilliantly like a sun tied to the cradle. When he snatches the jewel, the child cries and Jambavantha comes there and fights with Sri Krishna fiercely. The battle takes place for 21 days and then Jambavantha recognizes that it must be Sri Rama of Ramayana period with whom he had requested foolishly for a fight when he was asked to seek a reward for his services. So he realizes his mistake and bows to Sri Krishna and seeks his forgiveness for his sin and returns him the jewel and along with it his daughter also as a gift. Sri Krishna returns the jewel to king Satrajit after telling him all that had happened. The king feels ashamed for his action and seeks forgiveness from Krishna and gives the jewel to him as a repentance and also requests him to marry his daughter Satyabhama. Lord Krishna accepts Satyabhama but returns back the jewel to keep with Satrajit. When all the angels, sages and human beings all come to know of these incidents, they reach Sri Krishna and ask for his help in seeking remedy for saving themselves also from the curse of Goddess Parvati. Then Sri Krishna gets pity on them and tells them to remember this story and read it or hear it from others on this day of Ganesh Chaturthi each year after offering prayers to Ganesha and take the prasadam and then they will not get any bad name on seeing the moon on that day. So from that day onwards, everybody began performing Ganesh Pooja and hearing of the story of Lord Ganesha and the Shamanthakamani story of Sri Krishna each year on this auspicious day. On this day of Ganesh Chaturthi, an idol of Ganesha is purchased or made in the home with clay and installed on a wooden plank or seat neatly decorated. All people take the full bath from head to toe on this day and wear new clothes or clean and neat clothes to perform the pooja. The room can also be decorated with flowers and artificial garlands and mango leaves etc. A square frame made of bamboo panes known as "palavelli" is built or purchased from market and applying turmeric all over it, mango leaves and flower garlands are also decorated all around it and it is placed above the Ganesha's idol as a ceiling and one small paper umbrella is also placed over the head of Ganesha. Then some fruits like Guava, Sharifa, Apple, etc. and sugarcane pieces and maize corns are also tied to the palavelli on all four corners so that they hang by the sides of Ganesha all around his seat. After lighting the Diya and applying tilak to your foreheads and to the Ganesha idol, you can start the pooja by reciting some Ganesh slokas and stotras. Some important names of God and important slokas to be chanted at the start of this puja are given at this Link. The pooja is done with 21 kinds of specified durva grass and leaves known as "Ganesh pooja patri" or patri for Vinayaka Chavithi and other types of flowers and some raw fruits. These items are all sold at all marketplaces on the day prior to this Pooja. So you need not worry about their identity or availability. 108 names of Ganesha are uttered while offering these things to the idol of God. A little quantity of rice mixed with turmeric and kumkum is also offered now and then during the pooja. Some grains of this rice is to be sprinkled over your heads after the puja is over and again after hearing the full story of Ganesha as above. This turmeric-mixed rice after the worship of God become empowered with divine powers and is considered as receiving heavenly blessings from Lord Ganesha. After doing pooja with all these items, you light the incense sticks and show them to God for smell and then show the lighted diya also to Him and then offer the naivedyam to God. Some people prepare 21 kinds of modaks (round balls of different offerings) as prasadam depending on their capability. After offering prasadam, camphor is lighted and Mangala Arathi is recited. Some devotees perform all the sixteen sevas (services are done to God) to Lord but generally this much as narrated above can be done by all. How to Cook Modak or Undrallu for Ganesh Puja? Preparation of Undrallu / Modak offerings for Ganesha is very simple. It is narrated in easy steps in this below-linked article. After the puja is over, you can eat the prasadam and offer it to all others also. The story is read or heard in the evening time after lighting diya again to the Lord and after making a short puja. After hearing the story and putting some grains of the rice (that has been offered to God during the puja at morning which is known as akshata) on your heads, you can see the moon without fear as the curse on the moon will not affect you now. 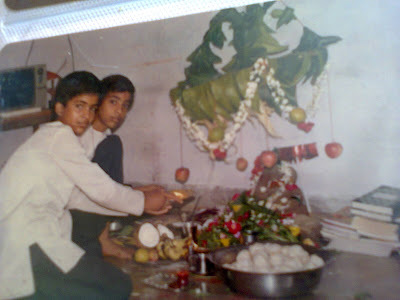 People visit others' houses also to witness their Ganesha on this day. It has been a practice to visit at least 7 Ganesha idols after puja on this day. At homes, most people celebrate this festival only for 3 days, if not for one day only.. Pooja is done on all the 3 days to Ganesha, if possible, both times and on the fourth day morning, the visarjan (dispersal or closing ceremony) is done by immersing the idol in the waters or by placing them at the pandals where grand-celebrations are carried out for 10 days; so that your idols are also carried away by them on the 11th day for immersing in lakes or rivers. The celebrations at pandals are very great to be seen. With dazzling lights and decorations and beautiful colourful idols of different sizes, they attract all the people and it has become a spirit of competition among colonies to make the celebrations as beautiful and appealing as they can. Where Our Indian Culture is Heading Towards?